Comfortable, sleek and gorgeous outdoor all-weather design. 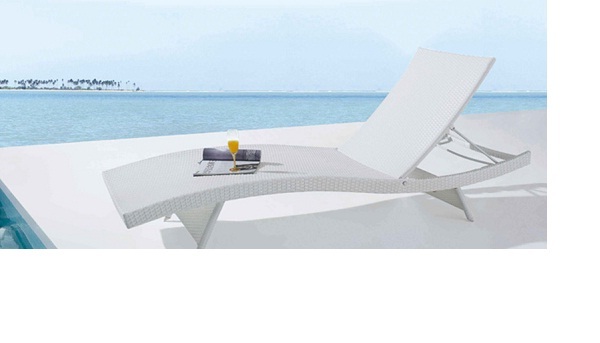 Great contours create comfort while white rattan puts you immediately into your Mexico vacation mood with just one look. We named it "Jetson," just for the reason you thought -- sweet memories of a cartoon show when we were young(er). This outdoor lounger is already a bestseller and we totally "get it." Comfortable, sleek and gorgeous outdoor all-weather design. Perfect for relaxing outdoors. Great contours create comfort while white rattan puts you immediately into your Mexico vacation mood with just one look. With "Jetson," now you can bring your vision of a super cool future, into your present life in Mexico. Sure to delight your family as well as your guests. All weather rattan woven by hand. Available in White and Chocolate. Please order in advance. We generally need 8 weeks' lead time.